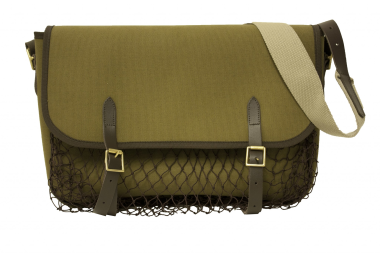 The Bisley Game Bag available in Green, features waterproof polyester with a PVC backing for added strength, protection and padding. The lining is also washable. The leather fittings are hand-cut from a large skin and sewn into place. The buckles are brass which, although is more expensive than other materials, adds strength and a more authentic look. Each bag features a comfortable adjustable strap with leather and brass fittings, and a large outer net measuring 17" x 12". Click the video tab above for a preview of how its made!